Agilent Technologies Inc. (NYSE: A) recently announced the industry's first receiver testing solution for secure digital ultra-high-speed (SD UHS-II) host products and memory card devices. Unveiled at the SDA event in Osaka, Japan, N5990A test automation software Option 120 accelerates accurate characterization and compliance verification of receiver ports in host products and memory card devices that support the SD Association's emerging UHS-II memory card standard. The automated receiver testing solution for the physical layer is based on Agilent's J-BERT N4903B high-performance serial BERT with supplementary instruments and accessories. SD is the leading standard for removable memory cards for portable consumer products such as cameras, mobile phones, laptops and GPS receivers. The new UHS-II memory card standard is based on SD revision 4.0. It provides high-definition video recording, low power consumption and data rates of up to 1.56 Gb/s for next-generation SD memory cards, such as SDHC and SDXC. Design and test engineers face several challenges when verifying standard compliance and margins of UHS-II receiver port designs: Many combinations of reference clocks, data rates and device types multiply test effort. To validate a receiver's stress tolerance, the pattern generator must allow injecting various types of jitter, such as random jitter, sinusoidal jitter and intersymbol interference over the complete data rate and reference clock range. Complex pattern sequencing is required to bring the device under test into loopback mode and force EIDLE entry and exit states. "Agilent has been heavily involved in the UHS-II test specification working group and is one of the key early contributors in test methodology discussions," said Miki Takahashi, director of Signal Integrity Engineering at Granite River Labs. "Agilent's UHS-II receiver software is an easy-to-use, optimized solution supporting UHS-II receiver tests that include complex receiver measurements like jitter calibration." "For UHS-II host and device designers, our solution speeds up receiver testing and provides accurate results for hosts and devices," said Ken Sakata, Agilent's representative in the SDA UHS TG working group. "The flexible architecture of our J-BERT, along with our expertise in receiver, transmitter and return loss testing, allowed us, once again, to address emerging test challenges." 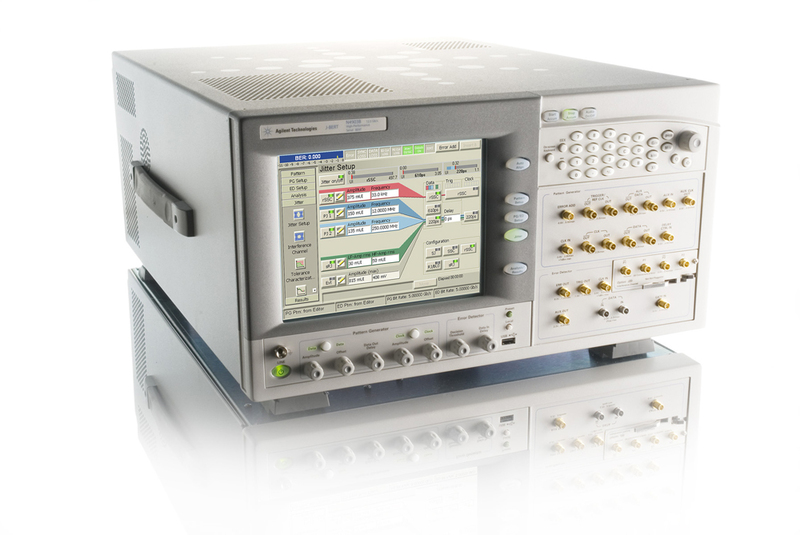 The Agilent receiver test solution encompasses the J-BERT N4903B high-performance serial BERT, the N4880A reference clock multiplier for testing host receivers, the N4877A clock data recovery for testing devices below 1 Gb/s, anInfiniium 90000 Series oscilloscope, N5990A-120 software for automating UHS-II receiver testing (developed by Agilent's solution partner BitifEye), and accessories. UHS-II test fixtures for device and host are available from Astek in the U.S. and from BitifEye in other countries. Support for host testing with the ability to lock the J-BERT pattern generator to the system's reference clock, even under real operating conditions with low voltage levels, slow transition times and spread-spectrum clock modulation. Device testing support for point-to-point and ring topologies with the ability to provide a reference clock with coherent and non-coherent jitter. Reduced test time from days to hours enabled by the UHS-II receiver-testing software, which simplifies pattern generation for loopback training and automates stress calibration, device and host receiver tests and EIDLE tests. Investment protection enabled by using Agilent instruments and test automation software that can be repurposed for accurate characterization for multiple gigabit test applications, such as MIPI™ M-PHY, PCIe®, USB, SATA and DisplayPort. For UHS-II transmitter testing, Agilent offers the N6461A automated test solution for Infiniium 90000 Series oscilloscopes. More information about the Agilent UHS-II receiver-testing solution is available at www.agilent.com/find/N4880A. Photos of the solution are available at www.agilent.com/find/jbert_images. The N5990A Option 120 UHS-II automated receiver test with loopback training software is available now and is priced at $14,600. One year of free software updates is included. Agilent Digital Test Standards Program experts are involved in various international standards committees, including theSD Association, Joint Electronic Devices Engineering Council, PCI-SIG®, Video Electronics Standards Association,Serial ATA International Organization, Serial Attached SCSI (T10), USB-Implementers Forum, MIPI Alliance, Ethernet standards (IEEE 802.3), Optical Internetworking Forum and many others. Agilent's involvement in these standards groups enables the company to bring the right solutions to market when customers need them. BitifEye Digital Test Solutions GmbH is an Agilent partner offering test software and accessories that complement Agilent's product portfolio. Using the BitifEye ValiFrame test automation software platform (marketed as the Agilent N5990A test automation software platform), engineers can combine instruments and test accessories into highly integrated and automated application-specific test systems. Information about BitifEye is available at www.bitifeye.com.